St Thomas Church is Listed Grade I. Since the Memorial plaque is situated within the Church, it is presumed to be covered by the Listing. 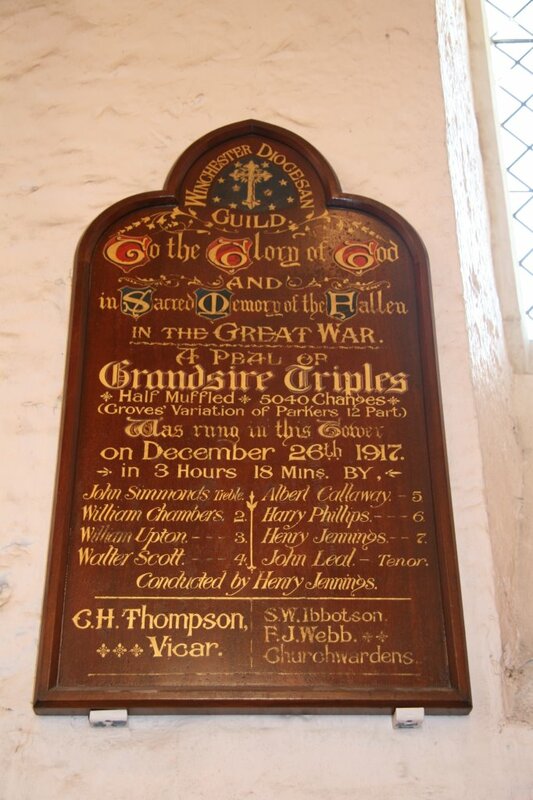 A Memorial plaque to three bellringers from St Thomas' Church, installed in the belfry on 21st October 1920. 'Executed by Mr J.T. Locke and Mr. Albert Callaway (a ringer).' See newspaper report below. F. CHEVERTON [sic] and J. MILLGATE are also named on the Winchester Diocesan Guild of Bellringers War Memorial at Winchester Cathedral. Thanks to Alan Regin for the photograph and other documents and information from the Central Council of Church Bell Ringers.